I was born an animal lover and always preferred the company of animals to people. Growing up, I always found comfort and safety in the presence of my furry friends. I became a vegetarian around the age of twelve, but unfortunately it didn't always stick... I would go back and forth about it for years. During one of my "on" times, my husband and I were scrolling through Netflix and came across a documentary called Cowspiracy. I had a pet mini pig named Hamlet who was happily snuggled in my lap while we watched, and I knew that the information I was receiving would be life changing. 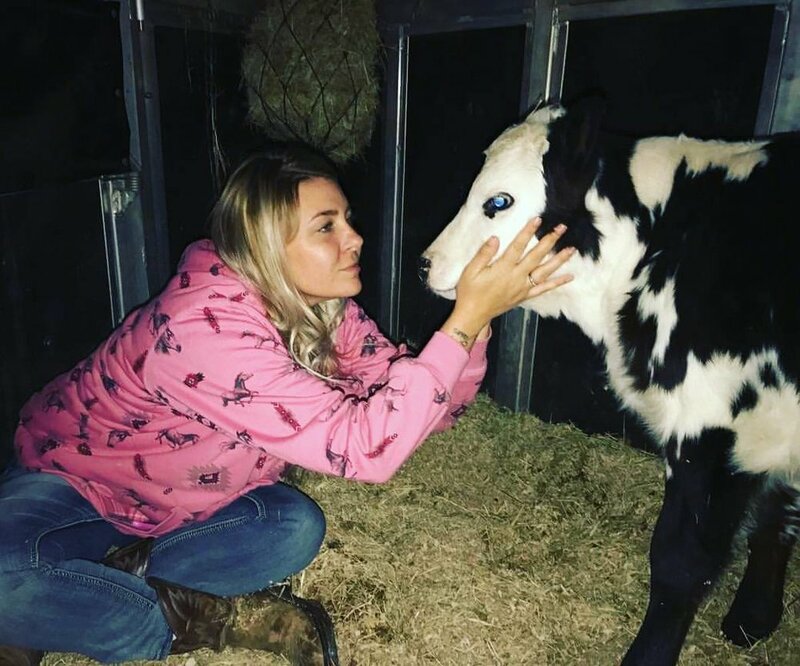 I couldn't believe the destruction factory farming caused to our environment, and I couldn't believe that I had ever had a part in such cruelty to animals, animals that I claimed to love. When the part highlighting how dairy cows are treated came on, I was in tears. I knew right then that I had to learn more, and I knew right then that I was a brand new vegan. Once I realized just how little I knew, I made it my personal mission to become as educated as possible in an effort to perhaps inspire some change in the way our world views farm animals. I had always been the type to bring home every stray I saw and I loved to volunteer at animal shelters and rescues. I searched for a sanctuary anywhere near us so I could hopefully become a part of it, but there was nothing anywhere in my entire state of Oklahoma. That's when the idea for Oliver and Friends Farm Sanctuary was born. My husband Jason was at this point 100 percent vegan as well, and we already lived on an acreage. We did a lot of soul searching and together decided to make the leap of faith in founding and opening our states' ONLY vegan farm animal sanctuary, right here in the heart of cattle country in the Midwest. Since then we have poured our whole hearts into saving and caring for all of our animal residents. We are sanctuary to cows, pigs, sheep, goats, horses, donkeys, chickens, turkeys, ducks, llamas, bunnies, dogs, and cats. We work so hard to give people the opportunity to meet these beautiful souls and see them for the sensitive and loving creatures that they are. Another part of our mission is to show people how easy being vegan is, and how important it is to live with compassion. Our animal friends need us all to work together to create a kinder and healthier world. We are a 501c3 nonprofit animal rescue and sanctuary in central Oklahoma, about 40 minutes NE of OKC, right off of historic rt 66.